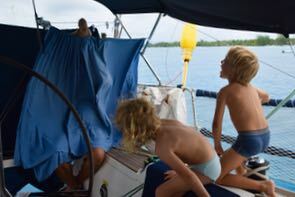 Back in Rangiroa after the Blue Lagoon, we had a fun morning with Alex and Inez: our bed sheets hanging for drying out became a theatre. Daddy making up a theatre scene with Alex’s teddy bear. The laugh of the morning! 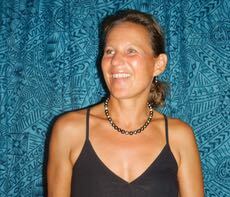 Later that day we went visiting The Paul Gauguin’s Black Pearl Farm on Rangiroa. Traditionally oriented towards coprah (dried coconut), the Tuamotus sprang to daylight with the coming of pearls farming, the phosphate exploitation of Makatea. 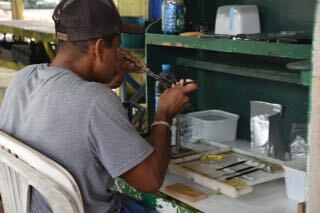 Tuamotu atolls rapidly became a major center for local economy with black pearl farming after tourism. 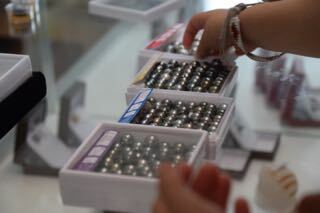 Luxurious black pearls which nowadays make Tahiti and her islands famous for, come at 98% from pearl farms of the archipelago of the Tuamotus. 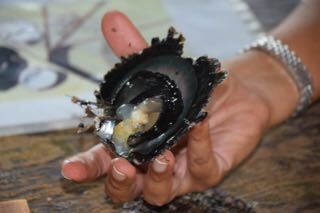 We got a proper visit: which clams are used and how the pearls grow in the clam. 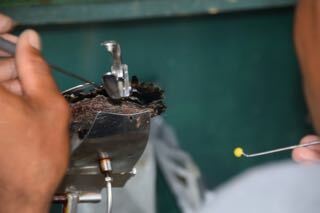 Nowadays the pearl are artificially grown, which means that they put in a little yellow thing (bought from Japan) and the clam starts to grow the pearl around this. It takes 2 years for a black pearl to grow to a normal size. If they want the pearl to grow bigger, they take out the pearl after 2 years and put it into another clam and let it grow for 2 more years. The bigger the pearls, the more expensive …off course. 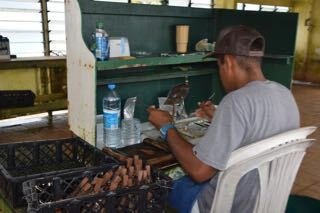 Before the financial crisis there were approx 800 pearl farms operating in the Tuamotus. Nowadays there are not more than approx 150. 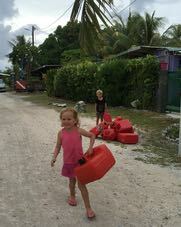 Wherever we went in the atolls we could see many empty farms. 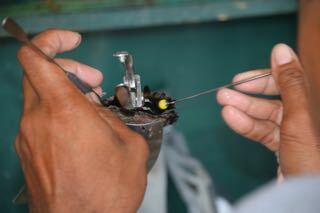 This pearl farm we visited had more than 80 employees. Today they are 15. The man here is specialised (has gone to pearl school in Rangiroa for 2 years) in putting in these yellow things in the clam. Before the crisis they hade 15 experts working with this. Today they are 2. Sad. 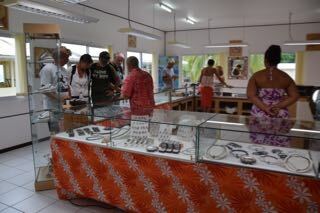 After the guided tour we got to see the beautiful pearls in the shop. There are several shapes, from very round and perfect (most expensive) to more deformed pearls and some with “rings” around them. The colour and the “shininess” has an important impact on the quality and the price. Louise went for some earrings and a necklace. Very happy! Coming back to our boats we had our few different needs to take care off. Cécile cutting Daniels hair for example. 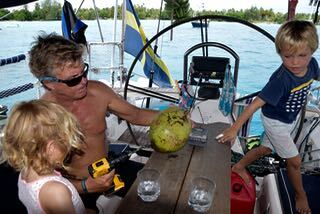 Jörgen working hard on opening a coconut! 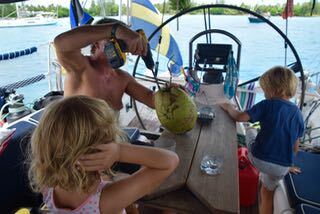 After frustrating attempts we managed and the coconut was delicious. Louise rowing over to Heidi to borrow some litres of diesel before we could have the chance to get to a gas station. 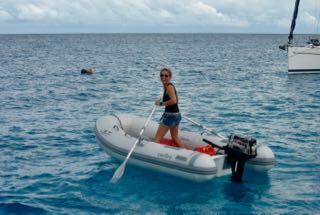 Cécile, being “femme française” as she is, is always very chic even when driving her dinghy. 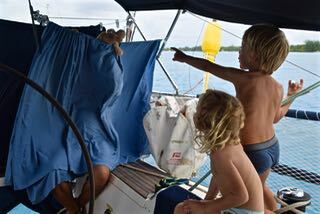 Daniel catching a fish from the back of the boat in Rangiroa. 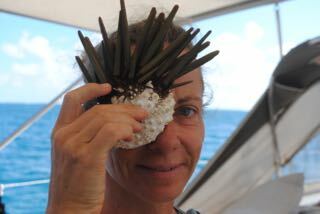 Cécile with a sea urchin. 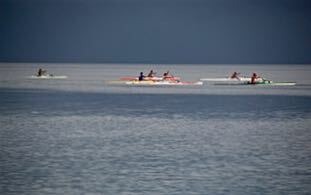 This picture below is not only beautiful for its colours and the traditional sport of canoe racing. 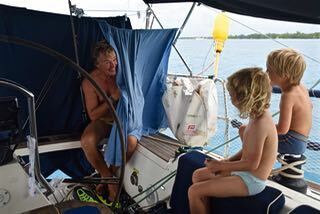 Look at the heavy rain clouds coming in in the horizon behind, the picture says it all what is bound to happen within a few hours... At 19h00 we had planned to have dinner at Chez Lili with 3 other boats. We saw the heavy weather coming in and thought that we might go earlier to the restaurant to avoid the rain. Luckily we did not! At around 18h30 the bad weather came over us very quickly and turned into a heavy squall with winds of 30 - 40 knots coming from nowhere! 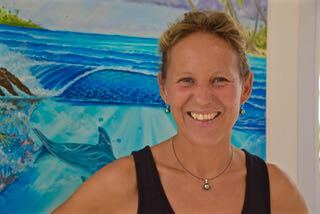 We first saw how the vessel Solo bumped into Heidi due to the fact that Solo was moored too close to Heidi. Watching this from a distance we were to jump into the dinghy to assist them when we realised that we were drifting too… from our mooring buoy in a great speed straight towards Heidi! Remember it is pitch dark, the wind is blowing hard as well as the rain is falling down. 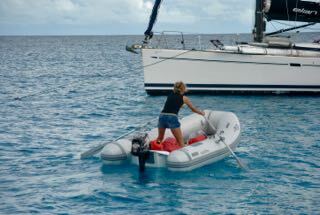 We realised that the heavy wind must have taken our buoy and the wind was now pushing us on towards Heidi. Jörgen very quickly put on the engine and managed to move us away from Heidi. However within only a few minutes we touched ground behind Heidi. 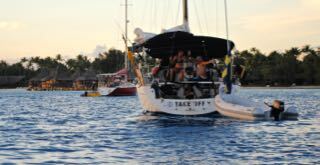 Not knowing if we touched sand or a coral head, not knowing if the ropes from the buoy were still in the water with a risk from them getting caught in the propeller, Jörgen reversed with full power and managed to release us! With this drama we did not dare to leave the boats, so the rest of the evening was spent in the cockpit and no restaurant. We were lucky nothing worse broke or that anyone got injured. The day after Jörgen kidnapped Louise taking her back to the Pearl Farm and offered a beautiful full black pearl necklace which she had tried on the day before without imagining it could be hers! 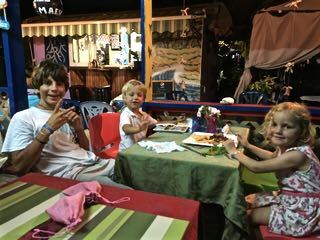 So we decided to stay in Rangiroa for another night and make it to the restaurant Chez Lili. None of us could make it the evening before and she had prepared and cooked the meal for us. So off course we wanted to have dinner Chez Lili that night. It was a lovely evening! Sunset light on Take Off in Rangiroa. 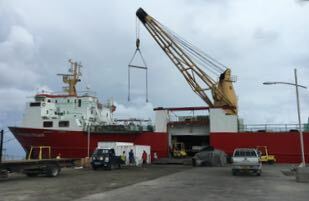 Before leaving Rangiroa we were lucky the ship had come in so we took the opportunity to provision as well as fill up our diesel (for the boat’s engine) as well as fuel (for the dinghy’s motor).